20 Number Of 5meater 30s Greige Cotton(100%) Fabric. From the thaans of cotton greige fabric 20 number of each 5mt are torn. 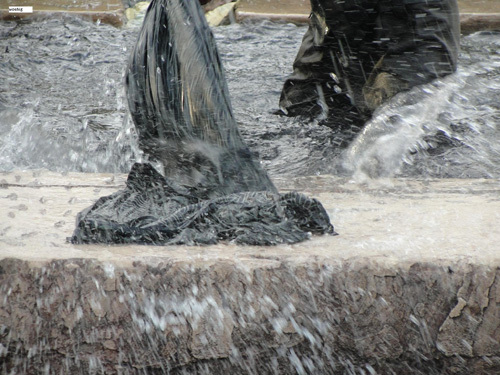 These fabrics are transferred to huge cemented storage where they are soaked in soda ash and clean water. This is done to destarch the fabric and remove the initial impurities. 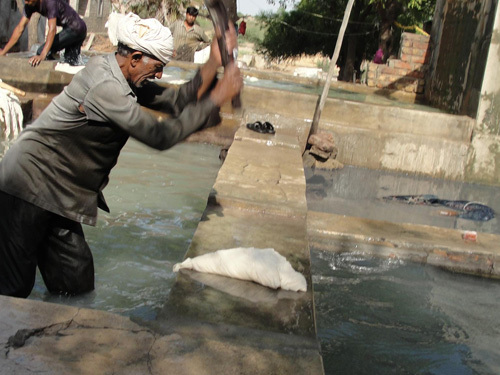 Cloth is soaked in soda ash and water for around 14-15hours. Gondh – Glue Extracted From Tree. In a mortar the gondh is pounded into granules then dissolved in water and is left to soak overnight. Meanwhile chunna is soaked in separately. Chunna is the main resist the whitening powder, which helps to ensure the smooth texture of the mixture, so it does not crack and make the surface impermeable. The next day Chunna is mixed with the thickening Gondh. 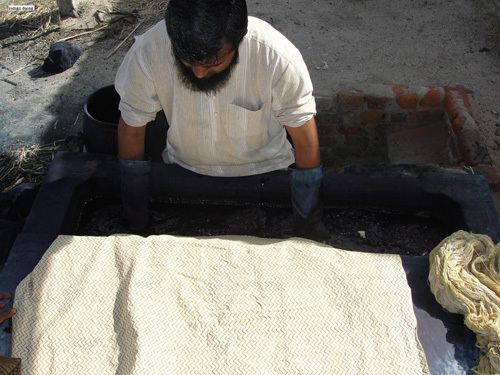 This mixture is then transferred to a container which is covered with layers of bamboo sieve, thick cloth, and thin cotton fabric.This provides even and required amount of the mixture over the blocks in order to get proper design.The craftsman thus pound the required designed blocks over the color and prints on the fabric. This forms the first outline base where different colored dyes are filled. After the print, craftsman takes the fabric and lays it down on the sanded ground in open air under the sun. He covers it with sand from the edges in order to avoid folding or flying of the fabric. 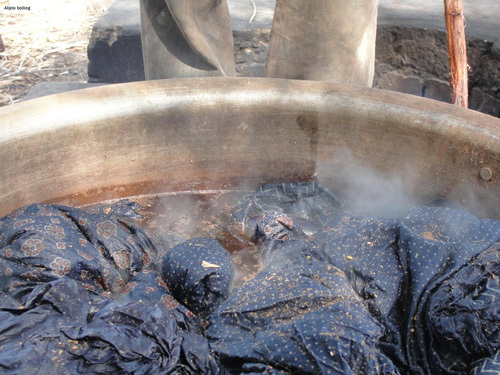 Bhichlana is the process of indigo wash. 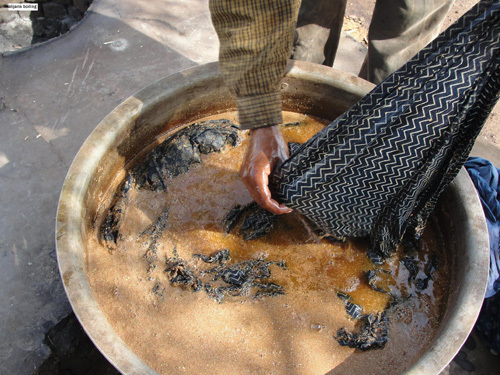 The dyed fabric when dried is taken for a wash in clean water. The craftsman beats the fabric harshly, this is important as the fabric gives out the blue color when in contact with water. Material: Indigo Powder Procedure: Indigo powder is mixed with water and stored. This mixture is stored for ages and fresh indigo powder is added constantly as required. Fabric after all the block printing is now ready for dyeing. The first dyeing is in indigo. The fabric is folded many times; the craftsman wearing cloves dips the entire cloth slowly inside the indigo solution waits for few seconds for the cloth to absorb the dye properly. He takes it out and hands it to other craftsman who takes it for drying in open air under the sun. The craftsman prepares a bhatti for this process. Over it water is kept to boil. Meanwhile alizer mixture is prepared. alizer brings out the red color of Imli powder.200grams of alizer is taken for 100meater of fabric. It is then wrapped inside a cotton cloth and immersed in 4-5 cups of water.The cloth acts as a sieve and allows the alizer powder to mix well in water. This mixture is poured in the boiling water and stirred well. Fabric is dipped in it and is allowed to soak the color. After 15minutes Dhabri flower is also put in the boiling water. Harrah is a fruit which is powered to give yellow color to the fabric. This is a very important ingredient as this forms the base of the fabric and oil provides proper absorption property. This solution also removes further impurities. 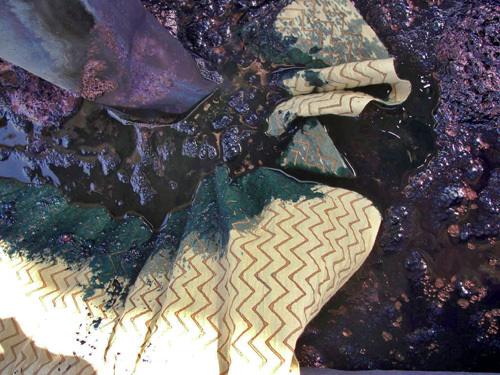 Fabric is dipped in the solution of Harrah, oil and water. This procedure is repeated twice so that every portion of the fabric absorbs the solution appropriately. The fabric is then put inside a machine which squeezes the fabric and drains out the water. This fabric is carried and beaten harshly twice on stone by the worker. This is done so that the color is spread evenly throughout the cloth. It is taken in the sun to dry. Fabric is dyed in indigo to get better quality and rich color. After all the process of block printing and dyeing the fabric is dipped in alum. This makes the color stronger on the fabric and thus increases the quality. Fabric is washed of the alum and kept for drying. Fabric is put in boiling water to give the final finish, remove the extra impurities and to give a smoother effect. Multani Mitti is crushed into powder; the craftsman then dissolves this powder in water over a cloth sieve in order to avoid lumps and softens it by hand till it forms a smooth paste.This paste is mixed with Gondh to provide fasten quality and alum which acts as a colorant to make the print visible. This mixture in particular is called ‘Kiriyana’. Kiriyana is poured into a vessel and the bamboo sieve is kept over it. No cloth is used here as the amount of color required on the blocks is more to get thicker print. Jhibri print is done over the black outline that is over Kirchi print. This overprinting is done as Kiriyana acts as resist.A brighter white color is resumed after dying as compared to the first outline print ‘Batana’. After the print, craftsman keeps the fabric for drying in the similar way as mentioned above. The five ingredients are mixed together. Turmeric and Annar powder provides yellow color; alum and Gond are the resists. Khar is the third color fill of Ajrak.The batana outline is filled with yellow color according to the design. Cow dung is spread and fabric is taken for drying. Iron pieces are soaked in water and kept for days to rot. meanwhile Bajere ka Aata is mixed with Gurh and kept overnight.The rotted iron is then mixed with the paste of Gurh and Aata. This mixture is put in the container layered with the similar materials. Khirchi print is done over the white base print in particular places which forms the required design. Khirchi print only defines the outline which latter is filled with black color.After the print, craftsman keeps the fabric for drying in the similar way as mentioned above. Imli powder, alum and Gondh are mixed together. Imli provides red color and alum and gondh acts as resists. kunka chekna is the second color fill of Ajrak. Blocks of Kunka Chekna are separate as it fills the bale design of ‘Batana’ print with red color. Cow dung is spread by the craftsman over the print to avoid misprints. Fabric is then kept for drying under the sun. Iron rot, Gondh and alum are mixed together. Iron rot provides the black color and helps in oxidation which further darkens the color. Alum and Gondh acts as the resist.Kut or Kala Dutta is the first color filling of Ajrak. This print fills black color to the jhibri outline print. 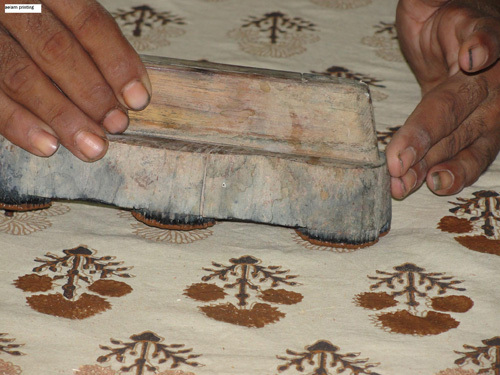 The craftsman after finishing each frame of print covers it with dry cow dung powder which sticks to the wet print. As the amount of mixture of color used is more the powder prevent misprints. After the print, craftsman keeps the fabric for dying under the sun. Fabric is again washed harshly to remove Dhabri flower and to let the color flow off. Meena means reapplication of resists over the fabric. Thus the process of Jhibri, Kut, Kunda Chekna and Kharh block prints are reapplied. The fabric is washed two to three times thoroughly with clean water. This removes the impurities and cleans the cloth off soda ash.